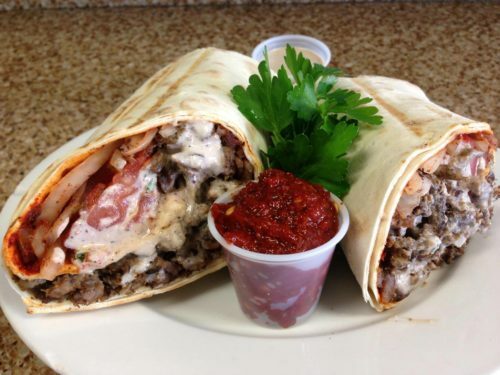 Shawarma (sometimes spelled “shawerma”) is meat prepared using a Middle Eastern process of grilling. Several pounds of seasoned meat are piled high onto a slowly rotating vertical spit and can be grilled for up to a full day. The meat is shaved off of the spit with a knife or small saw and is served in a wrap, in a sandwich, or on a plate. 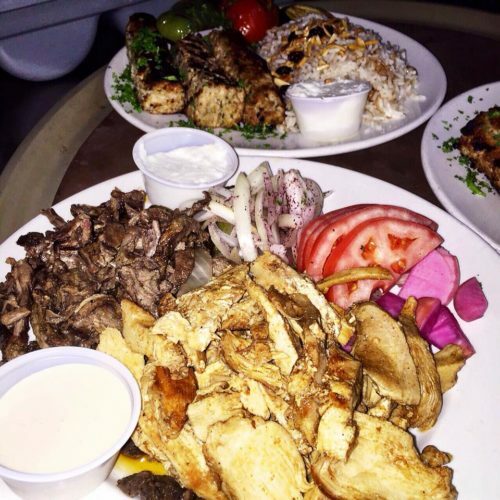 The meat used for shawarma includes: lamb, beef, chicken, turkey, veal, or a combination of these meats. It is usually accompanied by vegetables (lettuce, cucumber, tomato, onion, and french fries), dressing (tahini or hummus) and bread (pita or lavash). 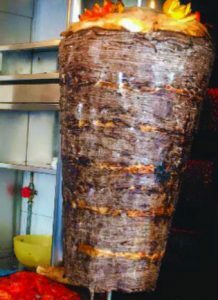 This style of vertical meat grilling originated from the Turkish döner kebab in the 19th century. 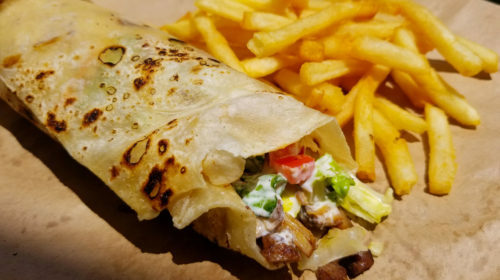 Other foods you may be familiar with that also evolved from the döner kebab include Greek gyros and Mexican tacos al pastor, both of which contain grilled meats turned on a spit. 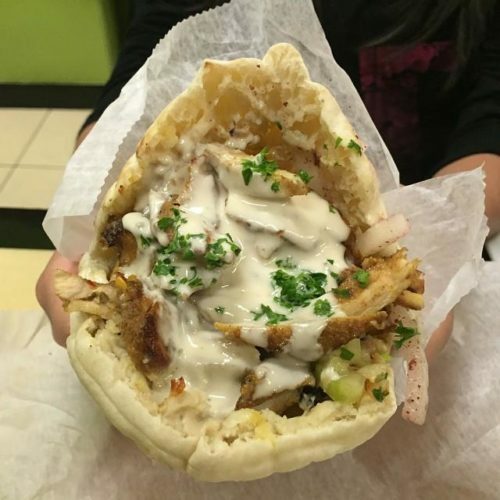 Looking for more places that serve shawarma? You can find a ton of them on Glutto right here. How can I make it? If you want to make shawarma properly, you’ll need your own vertical broiler. Luckily, you don’t have to buy a bulky industrial-sized one; a house-friendly counter-top rotisserie will do just fine. 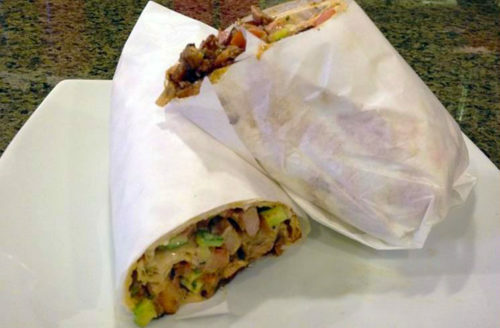 Follow this recipe for a relatively easy way to make homemade chicken shawarma. First, combine these ingredients in a bowl: chicken, shawarma spice blend, onion, garlic, olive oil, vinegar, orange peel and lemon peel. Mix until the chicken is completely coated in the other ingredients evenly. Place bowl (covered) in fridge for at least 2 hours (up to 12 hours). Remove the bowl of marinated chicken from the fridge and stack the chicken on the spit/skewer of the rotisserie. Top with a whole tomato (optional) and turn on the rotisserie to max heat. Grill until chicken is fully cooked through (times vary with machine). Slice chicken from the spit and place in pita/lavash. Add cucumber, tomato and onion. Then, top with tahini. Enjoy! Hey, the movie scene is greatly related with shawarma. I like the concept and the recipe too.